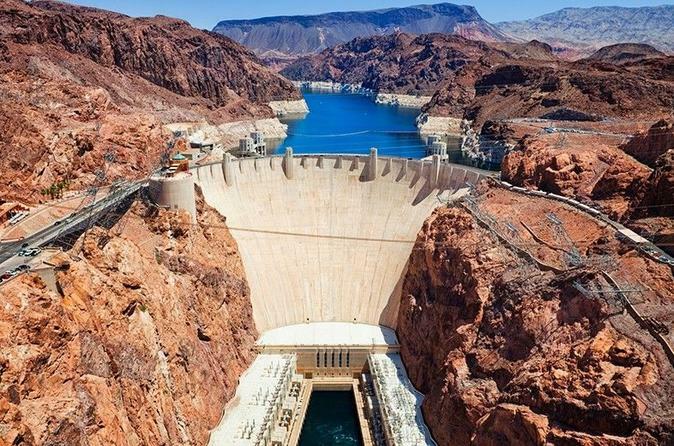 Your local expert and driver will pick you up and drive you to Hoover Dam in a private 3.5-hour tour to discover its magnificence and awesomeness. Book a private custom tour in a nice sedan (up to 3 people) or a SUV (up to 5) or a Limo SUV (6 or 8 people) to get a tailored itinerary and experience all the major spots of Hoover Dam and other options tours, including pickup and drop off at your hotel or accommodation in Las Vegas. Enjoy and experience the magnificence of the Hoover Dam, lying on the border of Nevada and Arizona! Named one of the Top 10 Construction Achievements of the 20th Century, this colossus was built in less than five years during the depression to harness energy from the Colorado River and is not to be missed. This is a Premium Service, all vehicles are equipped with air conditioning, Wi-Fi, cold water and Champagne* (*Available only for 6 & 8 passengers Limo Luxury Service). The service will be carried in a comfortable and luxury vehicle choosing between a Chrysler 300 FX8 Sedan or a Cadillac Escalade Limo SUV (5, 6 or 8 passengers).